It’s fairly normal for seniors to lose weight as they age because they no longer have much of an appetite, but decreased appetite can lead to excessive weight loss and malnutrition, which increase the chances of other serious health issues. To help your senior loved one stay as healthy as possible, you need to get him or her interested in eating again. Here are a few things you can do to boost your loved one’s appetite. Eating is a natural time for socializing, so suddenly having to eat meals alone can be fairly discouraging for seniors. You may be able to increase the appeal of meals by making sure your loved one always has someone to eat with. In addition to reducing loneliness, shared mealtimes can also increase appetite because seeing someone else enjoy food can stimulate hunger. In addition to preparing healthy meals for your loved one, a professional caregiver can provide companionship and social stimulation. Many older adults are choosing to age in place, and some need a helping hand to continue living at home safely and comfortably. Luckily, there is professional home care Montgomery seniors can trust and rely on. Several medications commonly prescribed for seniors include a loss of appetite as a side effect. Check your loved one’s medication to see if he or she may be taking something that affects the appetite. If so, talk to the doctor to see if there’s anything you can do about the issue. Your loved one may be able to switch to a new medication that doesn’t have the side effect or start taking the current medication at a different time. Seniors tend to feel full quicker, so they often complain about not having an appetite after one or two bites of food. You can make sure your loved one gets enough nutrition by switching to a different meal schedule with multiple small meals. It may be easier to consume regular snacks throughout the day instead of trying to eat three large heavy meals. Seniors who follow this schedule often end up eating just as much as people on a regular meal schedule. 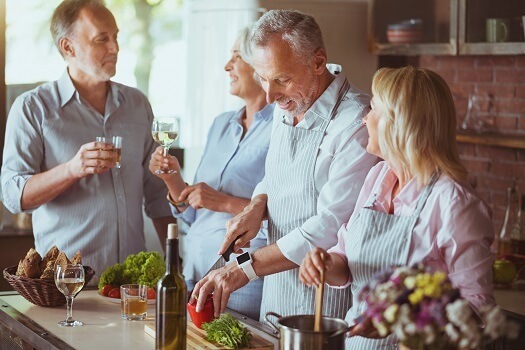 If family or work responsibilities make it challenging to prepare and serve several small meals for your loved one every day, consider adding a professional caregiver to your caregiving team. There are a variety of reasons family caregivers should consider respite care. Montgomery, AL, families often have additional responsibilities that make it more challenging to provide the care their senior loved ones need and deserve. A professional respite caregiver can take over your important caregiving duties, allowing you more time to focus on yourself. Because senses dull with age, even favorite meals may begin to taste boring and bland. Start adding extra seasoning to your loved one’s food to create something he or she will want to eat. Since many seniors shouldn’t have a lot of salt due to their blood pressure, experiment with spices that add interesting smoky, sweet, floral, sour, or savory flavors to make meals more interesting. Seasonings with an aromatic quality, such as garlic or ginger, may be particularly effective. In situations where nothing else is working, it may be time to consider the possibility of using appetite stimulants. Avoid selecting a random over-the-counter product, because some of these may contain ingredients that aren’t safe for seniors. Instead, take the time to discuss various types of appetite stimulants with your loved one’s doctor. Common options include zinc, thiamine, dronabinol, megestrol, and oxandrolone. If your loved one’s appetite is decreasing, a trained professional caregiver can be a great resource for making sure your loved one gets proper nutrition. Not every senior has the same care needs, which means they don’t all need the same type of senior care. Montgomery families can rely on Home Care Assistance to provide individualized care plans to meet your elderly loved one’s unique care needs. Our holistic Balanced Care Method was designed to help seniors focus on healthy lifestyle habits such as eating nutritious foods, exercising regularly, and maintaining strong social ties, and our Cognitive Therapeutics Method offers mentally stimulating activities that can stave off cognitive decline and delay the onset of dementia. If you need professional home care for your loved one, reach out to one of our Care Managers today at (334) 593-3988.